A tortuous 5 hr journey had me arriving in moody Ogwen Valley replete with a shrouded Tryfan occasionally offering a glimpse of it’s teeth. A steady stream of showers had punctuated the journey, the next one arriving just as I pitched the Laser Comp. There’s something splendidly raw about Gwern Gof Uchaf campsite – the spartan facilities keep the crowds at bay yet the location, exposed beneath the foot of Tryfan with views to the Ogwen Valley and the southern Carneddau, could hardly be bettered. I’d met Janet and get husband earlier in the year at the Tyn y Coed pub in Capel Curig. She is working toward her Mountain Instructor qualification and she kindly offered some rock-climbing instruction with me the mock (or real) client. After bumping into her again a month later I was reminded of the offer and the date was set. The only variable being the notoriously wet north Wales summer. 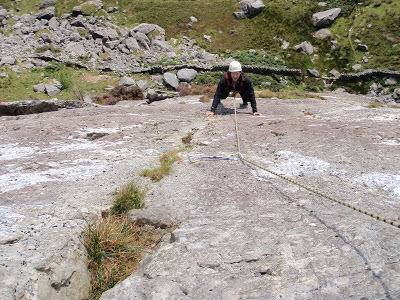 We met at the campsite, and accompanied by her friend Sue, we headed for Milestone Buttress on the north-west side of Tryfan. 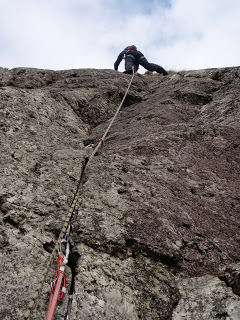 First off we were at the foot of the Pulpit route, a Diff climb, and after an initial briefing we were quickly climbing the first short crack, my feet nervously stabbing at the polished rock. Whether it was nerves or the sheer concentration of trying to take everything in.. the gear, it’s placement, the climbing calls, tying-in to anchors, setting anchors, I’m not sure but I can’t actually remember much about the route, except it was relatively undemanding, with big safe ledges for belaying. One thing I’d noticed was me not having enough confidence in my feet, over-compensating with arm strength, apparently a typical trait of blokes. Watching Janet was more akin to seeing a ballet dancer with her delicate yet precise foot movement and placement. At the top of the route we abseiled down a gully and then descended to the foot of the buttress for lunch and then an ascent of the Rowan route, another Diff, followed by an other abseil. We’d been lucky with the weather, which whilst ever threatening only delivered a few spots of rain all day. On Sunday, not trusting the weather in the valley, we headed further south to the Moelwyns, just past Tan y Grisiau and a step up in grade. 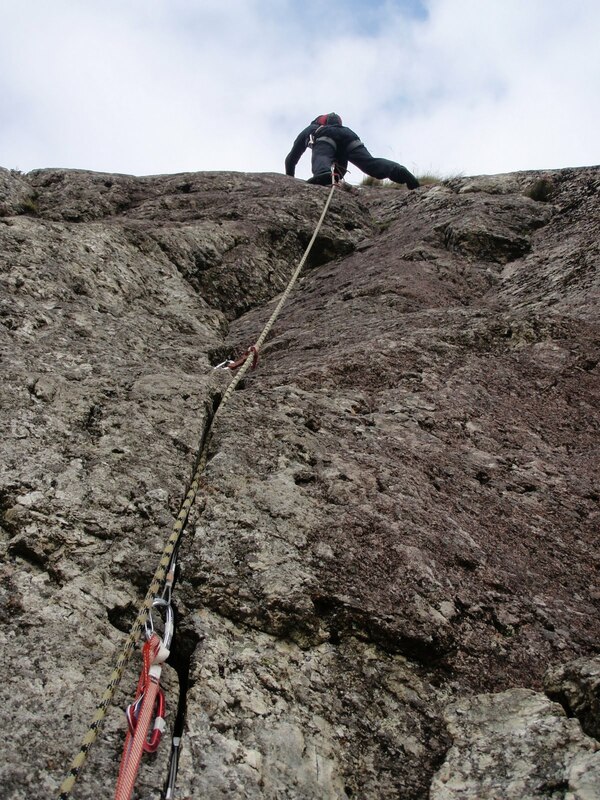 The fist route, Chic, was a V.Diff and very different it was too. Compared to the polished rock of Tryfan the rock was sharper and grippier, revealing small hand-holds just when you least expected. Today I was beginning to get involved more in helping to set up anchors and a bit of gear placement. Next up was Slack, another step up at Severe. This was a great route, the highlights being climbing up onto the top of a narrow 12-ft high flake and having to step across a 3-foot void onto a vertical wall which needed climbing, then further up there was a long traverse above a steep drop – climbing up seems so much less-unnerving than traversing when you just can’t help sense the space below. Slack was definitely my favourite route of the weekend. My brain was bursting with the technicality of the rope and gear management, but the actual process is actually very logical. Not once did I feel unsafe and the height and exposure never bothered me. I was of course in safe hands and with her week long MI assessment at the end of the month, a weekend teaching a novice hvaluable invaluable practice for her too. I really enjoyed the weekend and the relaxed company made it so much easier. And so another little string to my mountain-craft bow had been added but i’m under no illusion that there’s a great deal more to learn, but I’m keen to do some more outdoor trad-climbing soon. ← Previous Previous post: New Heights! 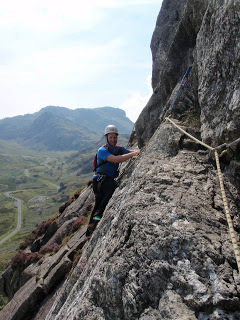 Until I did some scrambling on Pen yr Ole Wen, I hadn't done much good stuff for some time and I'd forgotten how much I enjoyed it. When you told me you were going to start doing some actual climbing and were thinking about climbing Mont Blanc I didn't actually realise how much I'd enjoy the prospect of some real climbing. Keep us updated as I think it'll be very interesting indeed to see you progress.